Shanna Swendson, author of the Enchanted Inc. series of books, is working what some authors might consider near-magic in a transition from traditional publishing to self-publishing. And being professionally bewitched seems to be growing on her. Don’t Hex With Texas is one of the quartet of books in Shanna Swendson’s Enchanted Inc. series published by Random House’s Ballentine Books. It’s the fourth book in the series. It almost was the last. Random House’s Ballentine Books had gone that far before declining to go further with the series. “I had one more book planned” in the series “to close out the story arc,” Swendson says. But she had nowhere to go with it. Until her Japanese publisher stepped forward and asked for it. The Japanese publisher asked for a sixth Enchanted Inc. book. And then Swendson offered a seventh to build out the series. So it is that Nos. 5, 6, and 7 were being published overseas but not in the States. I first heard this story in October when Nelson was on our CONTEC Conference Town Hall panel at Frankfurt Book Fair on the impact of self-publishing on traditional publishing. 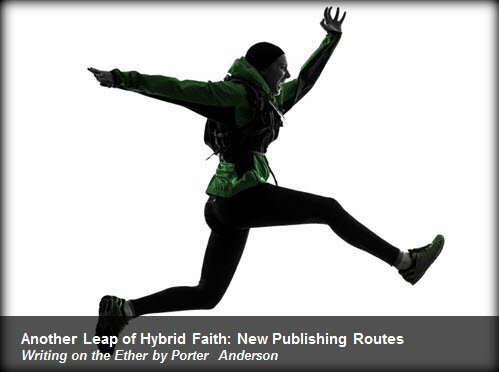 Ether host and Virginia Quarterly Review (great new redesign) web editor Jane Friedman wrote a top-notch account of the panel in Frankfurt, Is Self-Publishing the Most Important Transformation in the Publishing Industry? Nelson offered Swendson’s story to the panel as an example not only of how a traditionally published author may struggle to make a decision in favor of self-publishing, but also of how that decision might be seen to impact traditional publishing: books that might have been produced profitably by a publishing house are produced, instead, by the author, herself. Swendson is a remarkably thorough thinker about her career and how to handle it. A delightful conversationalist with a quick laugh, her comments carry with them the voice of her blend of women’s fiction and fantasy…and that means, of course, you’re hearing a hard sell to publishers in a market that traditionally likes its genre characteristics drawn in bold, bright lines. “That’s the all-or-nothing mentality,” she says, that can cause publishing “to glut the market. When a work doesn’t fit solidly in a genre, it can be hard for a traditional publisher to publish simply because it has to be shelved somewhere. And they want clear parameters for how to market it. With Shanna’s work, she’s solidly on that line between women’s fiction and fantasy. She has a solid fan base that loves her Enchanted Inc. series. And they are going to love her brand new series that’s in that same sweet spot for her audience. They don’t care what genre we call it. And this time, the non-Disney-wingy flight into self-publishing isn’t quite so daunting because she’s experienced the help of something called the NLA Digital Liaison Platform. That would be Ms. Clue Stick at work with Nelson Literary’s own program of supported self-publishing for clients. “To be clear, NLA Digital is not a publisher.” Kristin Nelson is careful to get that point across early on in talking about the agency service she’s formalizing this week with a new Web site, NLADigital.com. Lori Bennett is Nelson’s Seattle-based colleague at the agency on all things digital, overseeing the development of the platform. She stresses that the Web site is brand-new—as in work-in-progress new—and perhaps won’t have everything in place quite yet as we get this early look. Clients pictured on the site include Swendson, Barbara Freethy, Hugh Howey, Courtney Milan, Allison Winn Scotch, plus Jack and Jasinda Wilder. Clients can use the distribution-venue-only option [to] share their files and we simply publish the titles in outlets they currently don’t have access to for a commission. This mostly translates into library outlets such as Overdrive, 3M, Ingram, and Baker & Taylor as well as POD. Then there is the full-service option [which Swendson uses]. In this track, we are a full partner with the author on cover art, copyediting, converting of files, publishing the work on all venues available, etc. All for our commission. Some authors really aren’t interested in navigating all the fine details of indie publishing so they love working with us. The self-published Much Ado About Magic, fifth in the seven-book Enchanted Inc. series, has the same cover artist, Nina Berkson,used by Ballentine Books for the four original novels. Nelson tells me she the agency has 17 clients currently using NLA Digital platform. As Swendson notes, one of the great advantages to an author in such a service as NLA Digital is its catalog of books made available to library distribution services—one of the most challenging sectors for a self-publishing author to get into. In the three self-published Enchanted Inc. series books, for example, Swendson says, “We could hire the same copy editor and cover designer” that Random House had used, so the look and feel artist Nina Berkson developed for the series plays out seamlessly in the final three books, the self-published trio. A distinction in working with NLA Digital? — “The decision on cover art and all was up to me,” she says. That’s more control—and more responsibility. But in a very nice compliment to Nelson, Swendson says her agent is such a good developmental editor that “I hear Kristin’s voice in my head now as I write” guiding her on various points. “Tell Shanna thank you!” Nelson says, but clarifies that developmental editing isn’t her key priority. All is not self-publishing, even now, for Swendson. Both she and Nelson are proud to tell you that her debut YA novel, Rebel Mechanics, is to be released by FSG Books for Young Readers and the Margaret Ferguson Books imprint. The steam of self-publishing’s stigma can still fog up a writer’s viewpoint, too, Swendson says. Therefore, for her new series, the one with the Celtic legendry? Half the editors who have the novel still haven’t gotten back to me and I submitted it this past summer. This, despite repeated follow-ups on my part. That’s really egregious. If an editor doesn’t have time to read, just decline looking at the submission. Leaving an author in limbo is not good business. Shanna just emailed me this week and she said she would prefer to indie-publish. For context, it took me two years to convince her to indie-publish those Enchanted Inc. novels she already had written. Now it’s 18 months later…[and she] has changed her mind. Posted in Writing on the Ether and tagged Kristin Nelson, Nelson Literary, self-publishing, Shanna Swendson. Agent-assisted self-publishing does seem to be the sweet spot in publishing right now. I’m very interested to read about Swendson’s great experience with NLA Digital. Catherine Ryan Hyde and I have just published a new version of our “How to be a Writer in the E-Age” with Fast Foreword, the publishing-assistance wing of Foreword Literary. Very easy and pleasant way of launching a book. We’re very pleased (except for a small problem with Amazon reviews not yet migrating from an older version formerly with a small publisher–not Foreword’s fault.) We had control every step of the way. Agent assisted publishing seems to be consistent with what Cool Gus has been doing for four years. Sort of like the term hybrid has now been appropriated by authors, publishers, agents, and Martians. Smart agents understand they have to adapt and Kristin Nelson is certainly a smart agent. I believe you’re right, Bob, I think that the Cool Gus approach, like NLA Digital, is a form of assisted or supported self publishing — yours housed in the track record of your own work as an author, and Nelson’s in the framework of her agency. As you say, she is one smart agent, indeed. As a “senior” person, I was attracted to self-publishing because I didn’t want to wait the two-year average from being accepted by an agent to seeing my book on the bookshelf. Now, I’m seeing more and more of my writer friends self-publishing with some success (though admittedly, some not). I think it’s a very positive sign that there is now “agent-assisted self-publishing.” It supports what I think is a steadily growing trend. Thanks for all the good insight in this post.